Use fuzzy sticks (like pipe cleaners) and poms to create an adorable spiderweb wand to wave around this Halloween! "Come into my parlor said the spider to the fly..."
To make the spider, cut (3) black Fuzzy Sticks into thirds. Take (4) pieces of fuzzy stick and bend them to make (8) legs. Glue the legs onto the large Pom. For the head of the spider, glue the medium Pom to the large Pom. Add Wiggly Eyes and (2) small triangles made of a white foam sheet for teeth. To begin the web, take a white Fuzzy Stick and make a circle. Secure the ends by winding them together. Weave (3) white Fuzzy Sticks in and out of the circle, as shown. Wind (1) Fuzzy Stick over and under the (3) Fuzzy sticks from Step 5. Take all open ends of the Fuzzy Sticks and wind them together to secure the web. Next, glue your spider in the center. To make the fly, glue (2) small black Poms together. Cut out (2) small wings out of foam sheet and glue in place. Glue on (2) small Wiggly Eyes. Cut a piece of Sparkle Elastic Cord to about 12-inches. Tie the Elastic Cord to the web and around the middle of the fly. Spray a Wooden Dowel with black Simply Spray® Project Paint. Watch our instructional video on to use the spray. Glue your web to your Wooden Dowel. 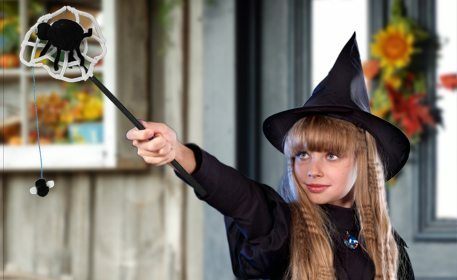 You now have a creepy crawly wand for Halloween!